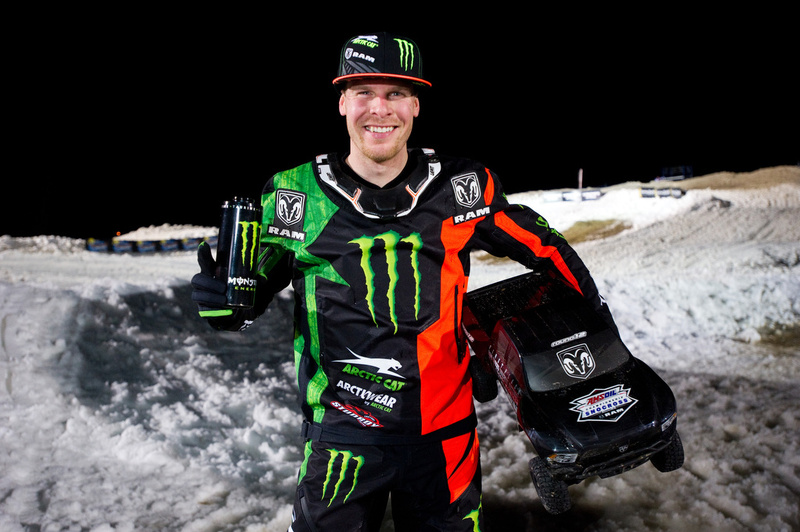 Monster Energy / Arctic Cat / Ram Truck’s Tucker Hibbert took double wins at the Ram Trucks Snocross National in Mt. Pleasant, Mich. to continue his win streak on the ISOC National Snocross tour. Hibbert is now 10-for-12 in the Pro Open class this season and holds a 102-point lead in the 2016 championship chase. Hibbert was in top form Friday night winning both his qualifying rounds and the final. After poor starts in both his qualifying rounds Saturday night, Hibbert had a hard time moving through the field to take a pair of fourth place finishes. The defending champion admitted to struggling in the sloppy, slippery snow and not feeling comfortable taking chances while getting blasted by heavy, wet snow roost. He knew getting a solid start could make or break his run for the win in the final. In the 15-rider, 18-lap final, Hibbert launched off the start line only to miss grabbing the Stud Boy Holeshot by inches. Hanging close behind frontrunner #54 Petter Narsa in the opening laps, he searched for a line to make the pass. On lap five, Hibbert got a fast run on outside of the downhill rhythm section, snuck to the inside of Narsa at the bottom corner of the hill to make the pass. Once out front, Hibbert went unchallenged to complete the weekend sweep. Next up for Hibbert is the penultimate event of the season. For the second consecutive year, Route 66 Raceway, right outside of Chicago, will transform its famed drag strip into a snocross course. For more information on the event, visit route66raceway.com. Meet Tucker and get FREE tickets to Ram Snocross! Stop by My Chrysler Dodge Jeep Ram in Mt. 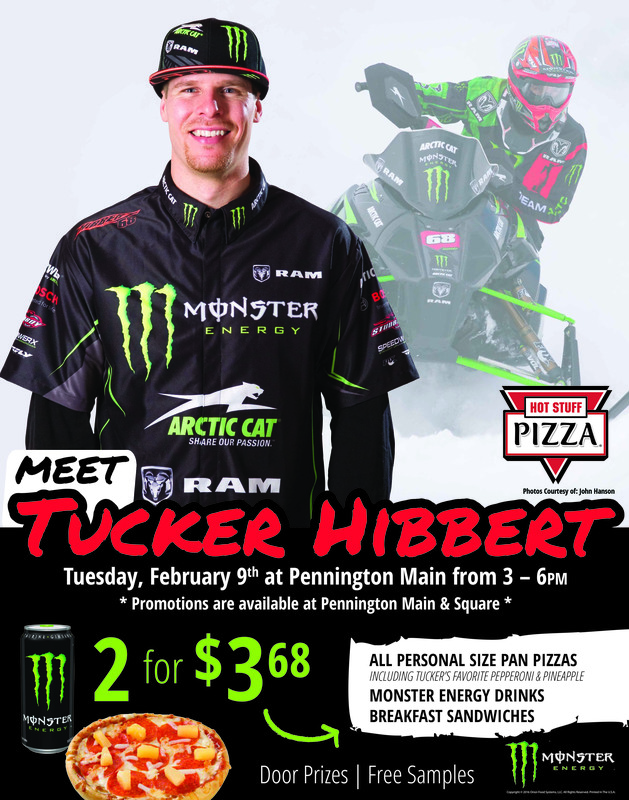 Pleasant, Mich. Thursday, February 25 5-7:00 p.m. for your chance to meet Tucker Hibbert and get tickets to the ISOC Ram Snocross National at Soaring Eagle Casino & Resort. Test drive a new Ram Truck between 5-7:00 p.m. for a FREE pair of tickets to the snocross event! BONUS: Tucker’s Ram Truck and Monster Energy / Arctic Cat race sled will be on display. 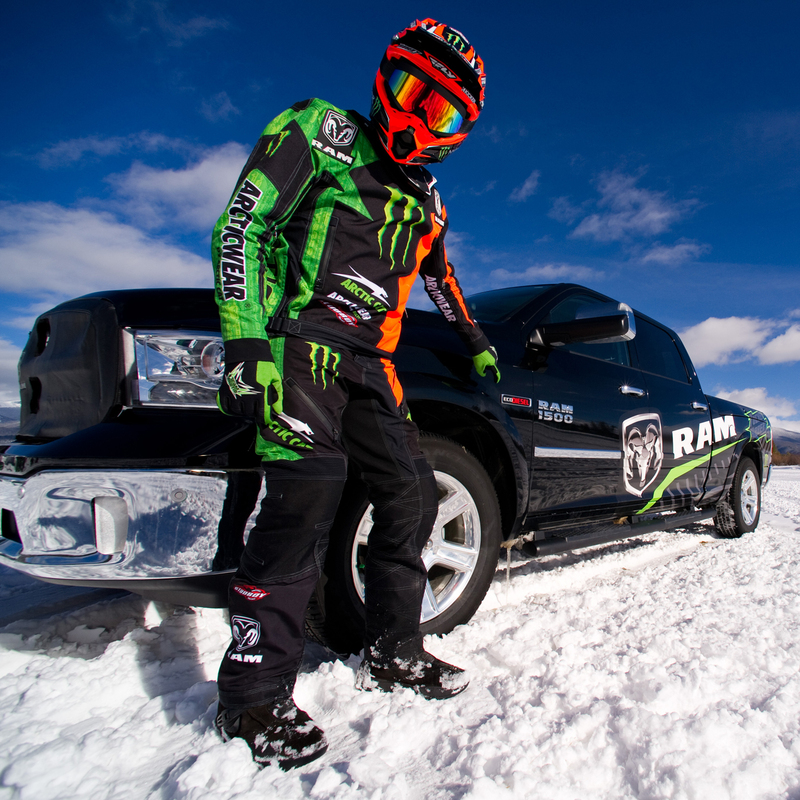 What: Meet Tucker Hibbert // Test drive a new Ram Truck to get FREE tickets to the snocross event! 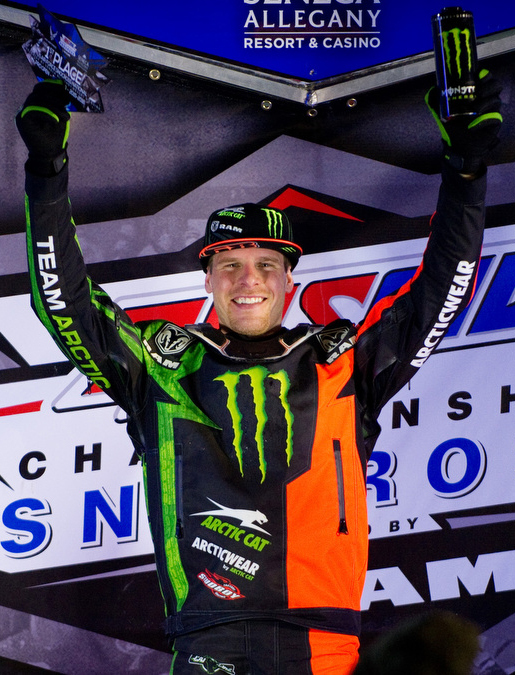 When: Thursday, February 25 // 5-7:00 p.m.
Monster Energy / Arctic Cat / Ram Truck’s Tucker Hibbert continued his win streak in New York by sweeping rounds nine and 10 of the ISOC National Snocross tour. Hibbert pulled the holeshot nearly every time he hit the track to win all four of his qualifying rounds and both Pro Open finals. Seneca Allegany Resort and Casino featured a high speed, technical track and with warm temperatures throughout the weekend, snow conditions constantly changed. Hibbert adapted quickly to each condition and put down blistering fast laps both nights. His most impressive run came in Saturday’s 18-lap Pro Open final where he opened a five-second lead over second place by lap five and went on to lap up to fourth place before taking the win. Hibbert now holds a 90-point lead in the 2016 championship title chase. The ISOC National Snocross tour will take a two-weekend break before hitting the final three events of the season. For more information on Hibbert’s schedule, visit tucker-hibbert.com. Meet Tucker February 9 in Thief River Falls, MN! Meet Tucker Hibbert in Thief River Falls, Minn. Tuesday, February 9. Stop by Pennington Main 3-6:00 p.m. to get an autographed poster and take advantage of deals on Hot Stuff Pizza and Monster Energy. His Arctic Cat race snowmobile and Team 68 Ram Truck will be on display too! 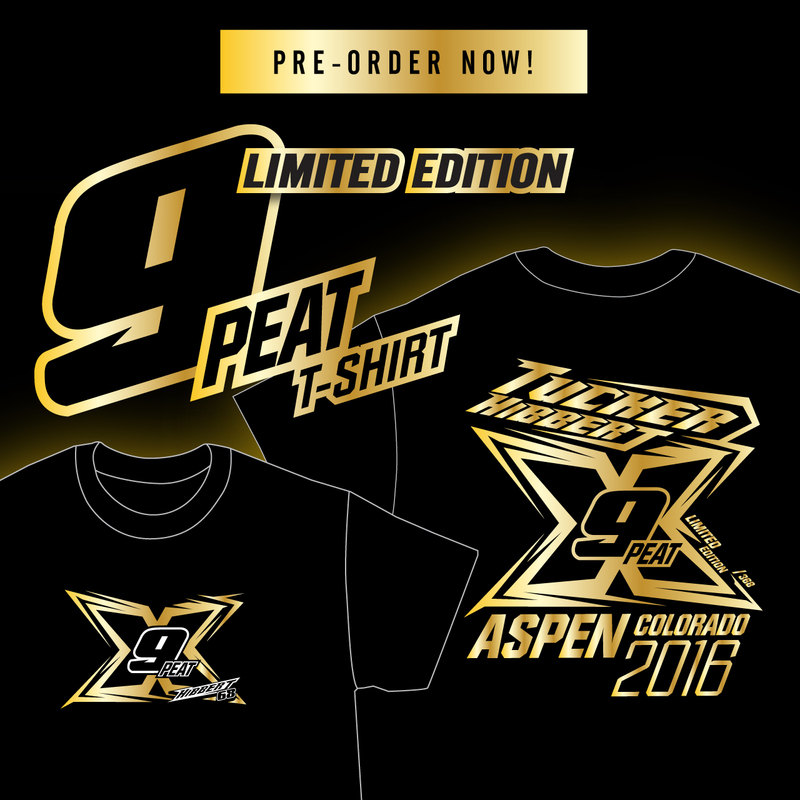 When: Tuesday, February 9 // 3-6:00 p.m.
Own a piece of history with Tucker Hibbert’s Limited Edition 9-peat t-shirt. Only 368 shirts will be printed to commemorate his record-breaking gold medal performance in Aspen, Colo. January 28, 2016. Each shirt will be hand numbered and autographed by Tucker. Don’t wait to order yours – shirts will sell out fast!